Amazon has just announced the availability of a new $119 Paperwhite e-reader with a 6-inch 300ppi display and a new font and book layout system that will make it easier to dig into The Martian during summer vacation. The reader will ship on June 30 and is available for pre-order now. It also includes a backlight and is available with or without cellular data and Amazon’s advertisement offers. The WAN model costs $209 without special offers. The reader is essentially the same as the previous Paperwhite – a bright, almost white glare-free screen inside a nearly featureless slab of black plastic – but this model has “twice as many pixels” as the previous version and will display “laser quality text.” Font nerds will rejoice because Amazon has created a new typeface, Bookerly, that they claim is easier to read. They will also add a new “typesetting engine” that will improve book layout even at larger font sizes. 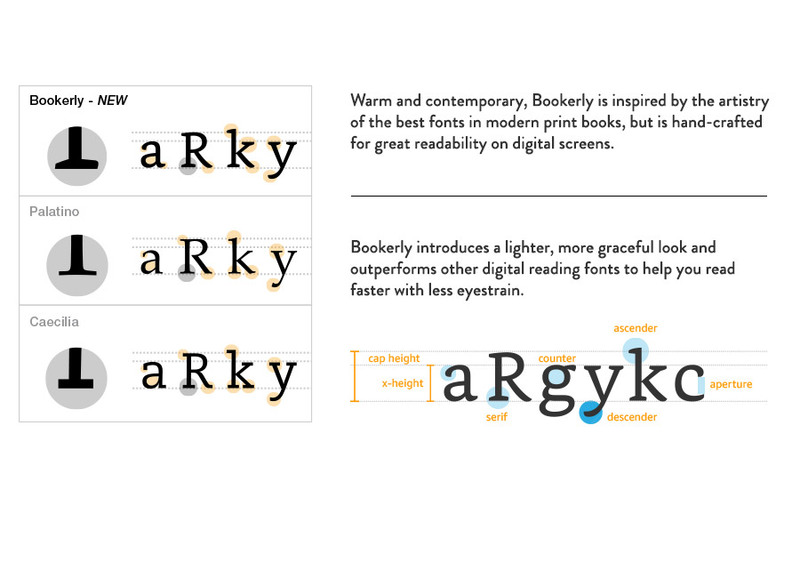 The all-new Kindle Paperwhite now offers Bookerly, an exclusive font crafted from the ground up for reading on digital screens. Warm and contemporary, Bookerly is inspired by the artistry of the best fonts in modern print books, but is hand-crafted for great readability at any font size. With all this focus on clarity it’s clear Amazon is aiming this device at a group of consumers still reading print books: folks who might be a little older and are starting to need reading glasses. By creating a reader just for them, they are grabbing another quarter of the ereader market – the previous two quarters being the early adopters and the rabid readers. All they need to do is tackle the child and young adult market with a shatterproof reader that can’t play Angry Birds and they’ll own the whole pie.